The lawn is greening up and yesterday when Dan and I were sitting on the back deck, we commented on how the trees are starting to bud. I am coaxing spring along with some flowers for the front step. (that's Lilly peeking out the door). I'll have to take them in later this week, when snow is predicted for a day or two. That's the nature of spring. But, the Easter wreath on my front door will stay, a reminder to Mother Nature that the calendar does say spring. In honor of springtime, I got a shorter haircut! I love that it takes less time to dry. And I've been going to physical therapy for my knee, and it has worked wonders. The best part is getting a massage! It has really helped with the swelling that remains. I only wish they would treat the other knee, poor thing. Baseball is back! Dan and I are going to our first game this evening, hoping the Rockies will get a win and avoid a sweep by the Dodgers. It's 70 degrees out right now, so it should be a nice evening at the ballpark. After struggling to find a book to get into, I landed on this one yesterday. It's been sitting in my TBR pile for at least a year. 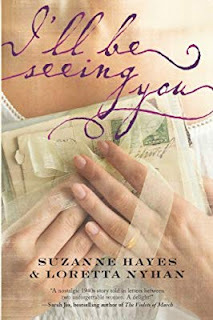 I'm loving the story told in letters between two women during World War II. One is a young mother in Massachusetts with a toddler and a newborn. The other woman lives in Iowa, and her 18-year-old son has just enlisted. Both women's husbands are also soldiers in the war. It is heartfelt and beautifully written, a story of how the women become friends through their letters. Dan and I are much anticipating the arrival of our 5th grandchild sometime in May. In the meantime, it's hard to believe that these two are another year older! Their birthdays are six days apart, so they've been sharing the celebration for the past few years. This year the party was at the local rec center, where they each had their own cake, opened presents, and then went swimming with their cousins. It's wonderful to be three. . .
And fabulous to be four . . .
More flowers -- alstroemeria. They bring such a nice splash of color inside and they are so inexpensive. Best of all, they last for several weeks. So glad that you had a great time with your friend. Those kind of visits make for wonderful memories. What a fun filled two weeks! I’ve been spring cleaning, not exciting but it will be so nice when it’s complete. Of course is cleaning ever really complete? Sounds like a fabulous 2 weeks, Karen. What a blessing to have so many grandchildren---I am looking forward to the day when I become a grandma. I love that old milk can. So beautiful, and the flowers make it even more so. Yes, baseball season is on again. My son and I celebrated opening day with hot dogs and peanuts at his house, while we watched our (Red) Sox get beaten by Seattle. The Sox are off to a horrible start. I hope your Rockies are doing better. Nothing like old friends!!! I am going to see my longest friend in June, when I go to Pittsburgh for a wedding. Am so looking forward to it. Isn't everything made more enjoyable with a glass (or 2) of wine. 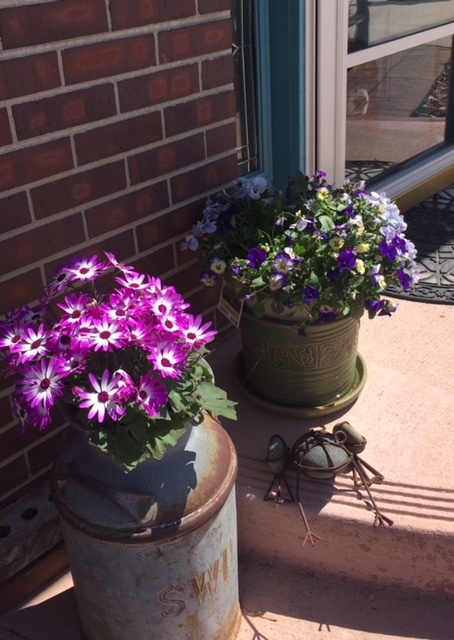 What beautiful flowers on your front porch! I bought a pot of pansies a few days ago and poor things are going through some terrible weather conditions right now - anything from rain to 50 mph winds to snow. And just earlier this week we got teased with two days of sunshine and 70 degrees. Hard to believe we're supposed to get a few inches of snow on Sunday. This is like the winter that will just never end! How wonderful to have a visit from your best friend! Does she live far away, or in kind of close proximity? Glad to hear your knee therapy is going well. You are lucky that they massage it - I didn't get that during my knee therapy! I start going to PT for my back on the 23rd. I'm actually looking forward to it, simply because I want to feel better. The book you're reading sounds really good. I'm going to look that one up on Amazon. I just finished Lisa See's newest book, The Island of Sea Women. Very engaging historical fiction; at times a little slow so I just skimmed through those parts. This afternoon I'm going to start Kitchen Yarns by Ann Hood. Your grandkids are so cute! How wonderful to be expecting the fifth. I hope that Brian and I are blessed to have a grandchild one day. You may remember me, Mildred from GA. I saw your blog on another and was so happy to find you again. What precious grandchildren and congrats on a new addition. You are blessed to have an old friend to spend time with. Thankful that your knee is better.